On Tuesdays I stream Super Smash Bros. Ultimate, whether it’s an arena or World of Light. On Thursdays I switch between Paper Mario 64 and Paper Mario: TTYD. On Sundays I play just Paper Mario: TTYD to try and get through my backlog of challenges. Right now, my ultimate goal with Twitch is to become a Twitch Partner. To do this, I need to accomplish a certain number of tasks. The last one I need is to have 75 concurrent/average viewers for a month. That means I need YOUR help! Please share my stream with friends/family/strangers if you think they’d like my content! It’s the best way to support the stream. If you still want to support me, you can subscribe on Twitch or donate! Subscribers get access to a special sub only Discord channel on my Discord server, get access to awesome emotes, and will be part of special events that I’m working on doing for subs only. Right now, I have a goal of 30 subs with the goal being a special “Wheel of Whimsy” stream where I go through the Pit of 100 Trials and get a new badge every floor that I must equip! 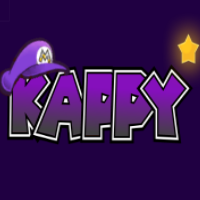 To donate, please use this link: https://streamlabs.com/kappylp Any donation of $5 or more gets their message read!